Although data can take many forms, when generating visualisations, running statistical analyses, or simply querying the data so we can have a conversation with it, life is often made much easier by representing the data in a simple tabular form. A typical format would have one row per item and particular columns containing information or values about one specific attribute of the data item. 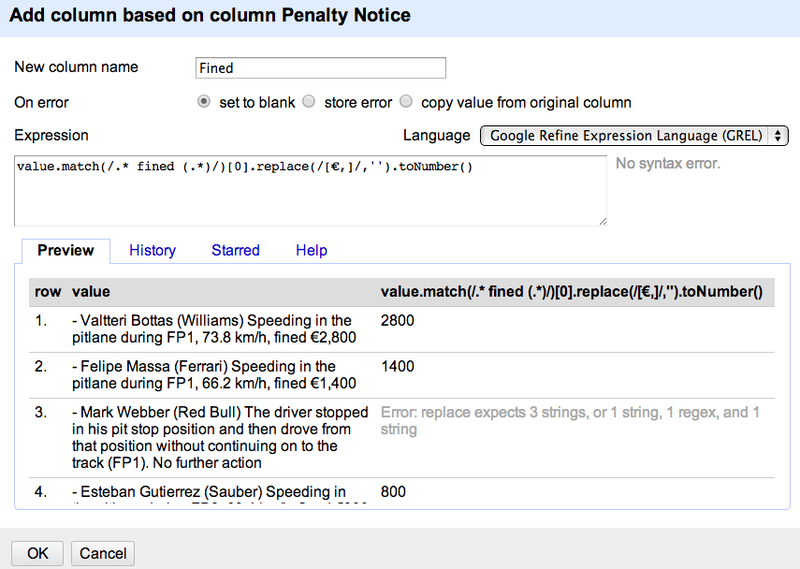 Where column values are text based, rather than numerical items or dates, it can also help if text strings are ‘normalised’, coming from a fixed, controlled vocabulary (such as items selected from a drop down list) or fixed pattern (for example, a UK postcode in its ‘standard’ form with a space separating the two parts of the postcode). Tables are also quick to spot as data, of course, even if they appear in a web page or PDF document, where we may have to do a little work to get the data as displayed into a table we can actually work with in a spreadsheet or analysis package. 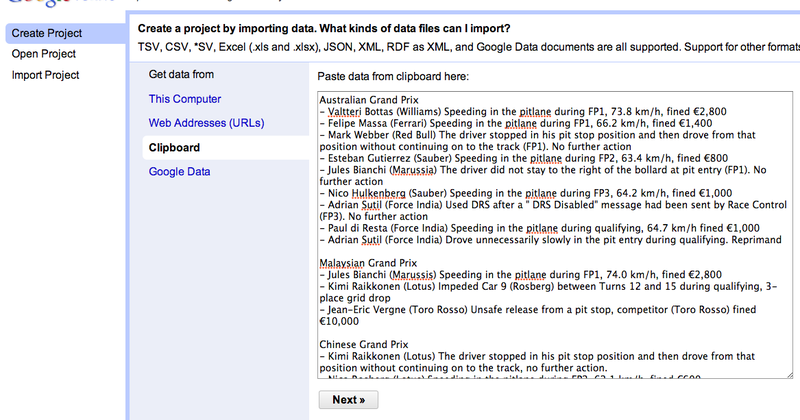 The recreational data puzzle I set myself was this: how can we get the data contained in the descriptive sentences about the penalties into a data table that could be used to ask questions about different rule infractions, and the penalty outcomes applied, and allow for the ready generation of visualisations around that data? 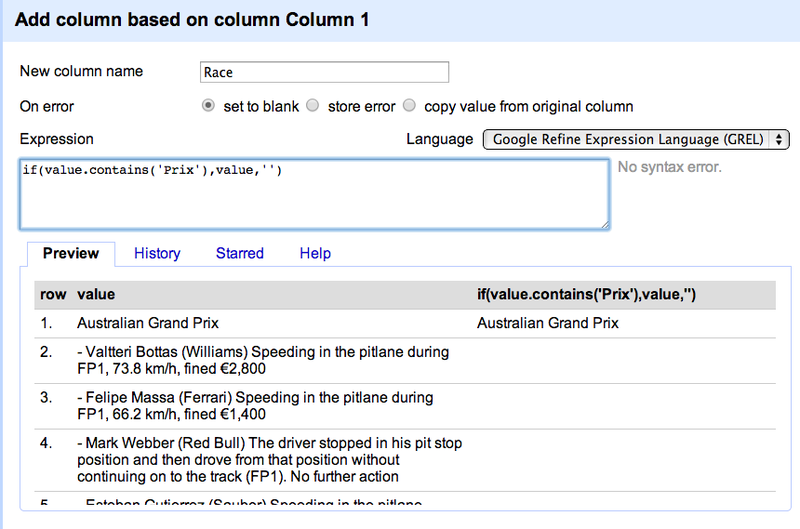 The expression if(value.contains('Prix'),value,'') finds the rows that have the title of the race (they all include “Grand Prix” in their name) and creates a new column containing matches. 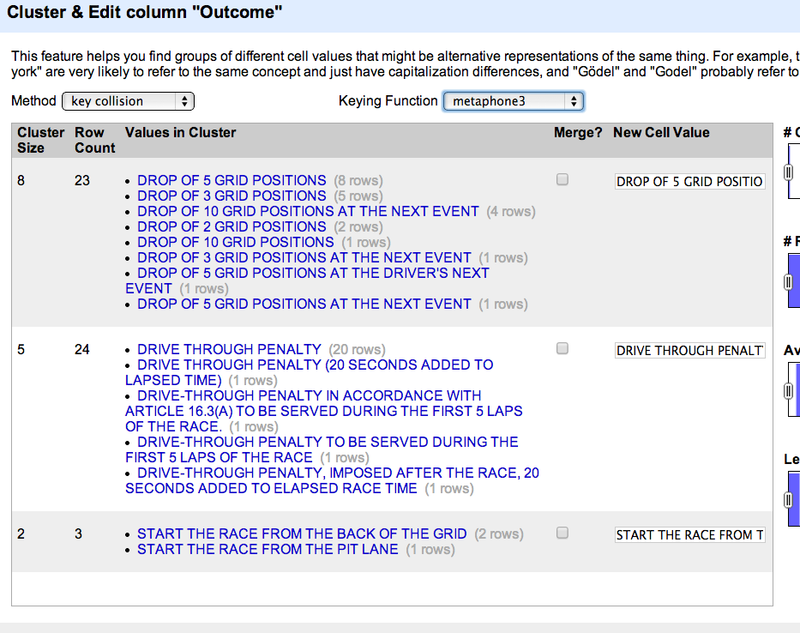 (The expression reads as follows: if the original cell value contains ‘Prix’ , copy the cell value into the corresponding cell in the new column, else copy across an empty string/nothing that is, ”) We can then Fill Down on the race column to associate each row with particular race. 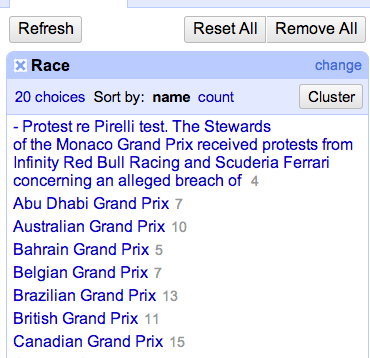 Looking down the row number column (left hand most column) we see that rows 19, 57 and 174 are now the overflow lines. 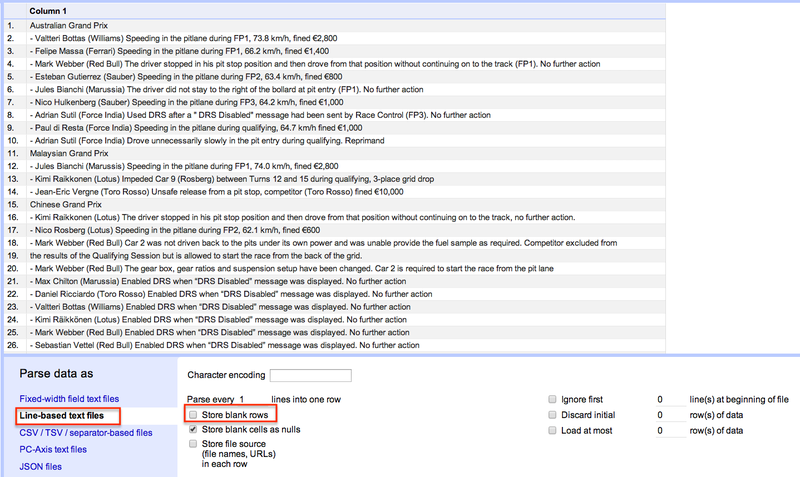 Remove the filter an in the whole listing, scroll to the appropriate part of the data table and cut the data out of the overflow cell and paste it into the line above. 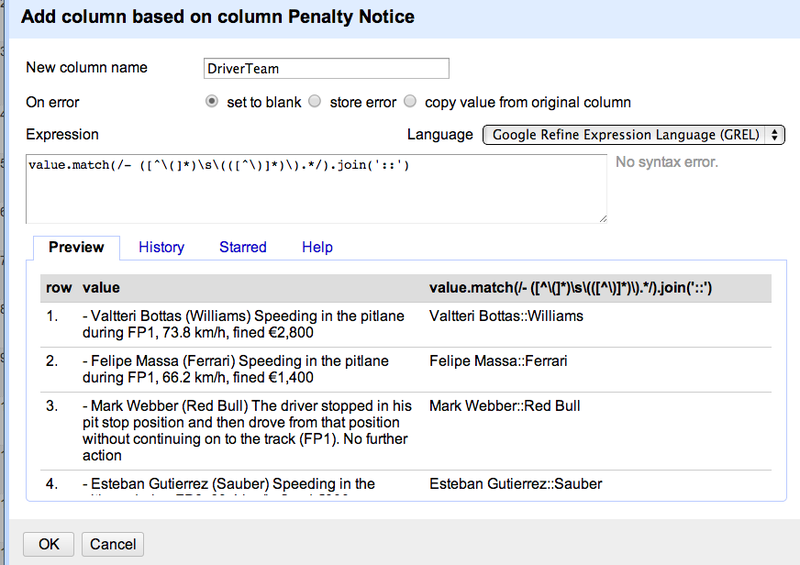 By chance, I also notice that using “Prix” to grab just race names was overly optimistic! Phew – that was the only rogue! 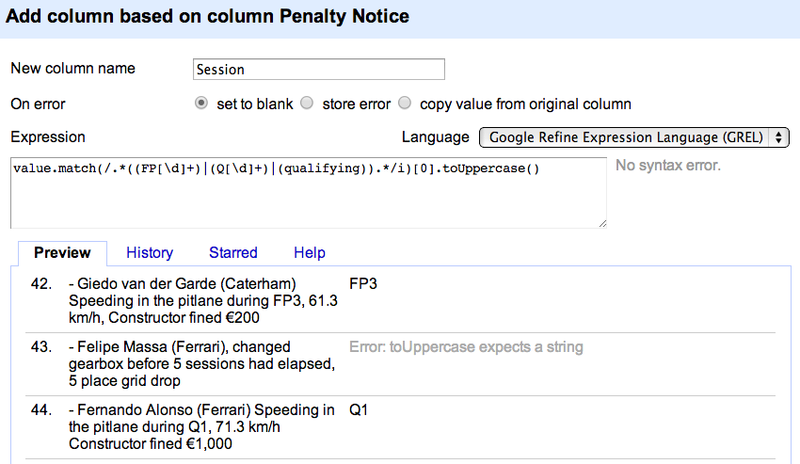 In line 56, cut the rogue text from the Race column and paste it into the penalty notice column. 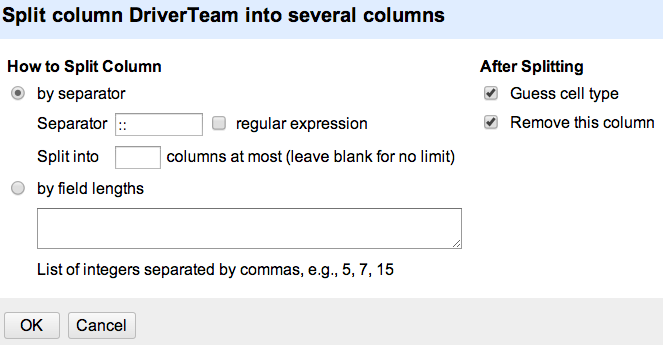 Then also paste in the additional content from the overflow lines. So where are we now? 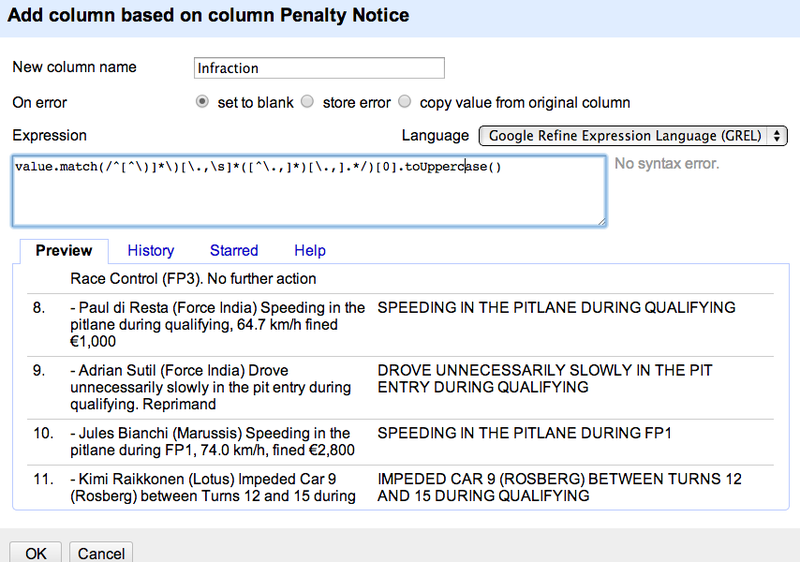 We have a data file with one row per penalty and columns corresponding to the Grand Prix and the penalty notice. 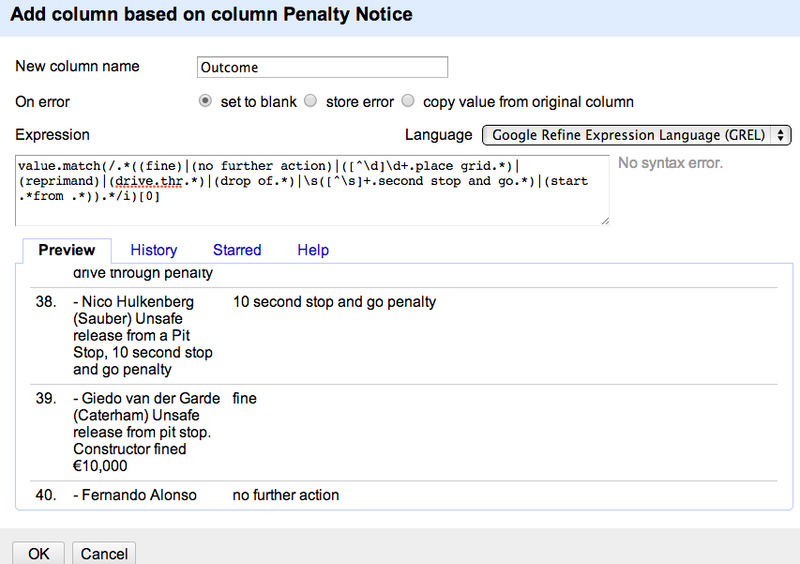 We can now start work on pulling data out of the penalty notice sentences. 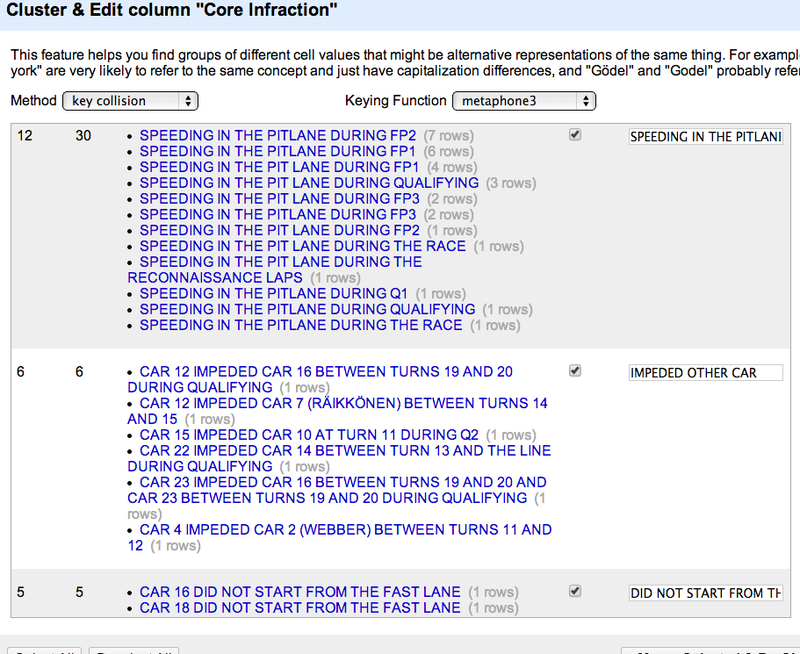 Learning from out previous error, we can use the text facet tool on the drive and team columns just to check the values are in order – it seems like there is one oops in the driver column, so we should probably edit that cell and remove the contents. 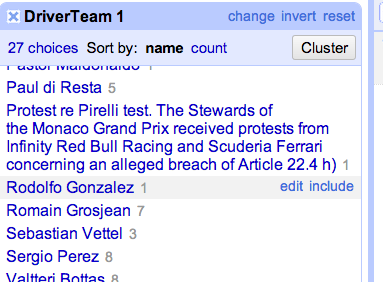 We can also check the text facet view of the team column to make sure there are no gotchas, and pick up/correct any that did slip through. 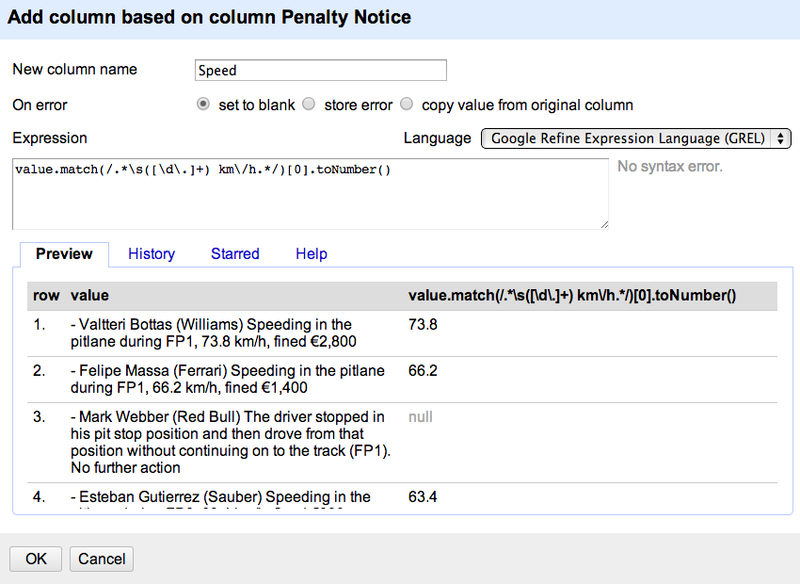 We can check for other fines by filtering the the Penalty Notice column on the word fine (or the Euro symbol), applying a number facet to the Fine column and looking for blank rows in that column. 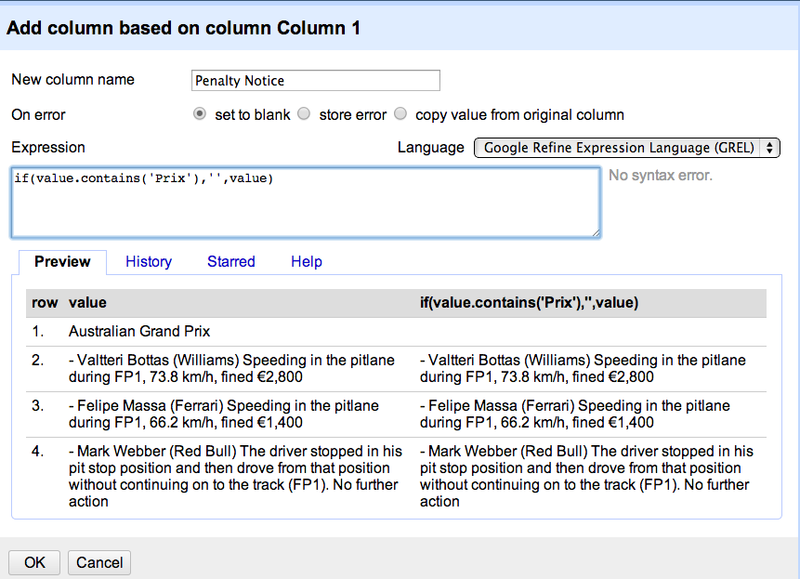 So now we have a column that has the value of fines – which means if we export this data we could do plots that show fines per race, or fines per driver, or fines per team, or calculate the average size of fines, or the total number of fines, for example. What else? 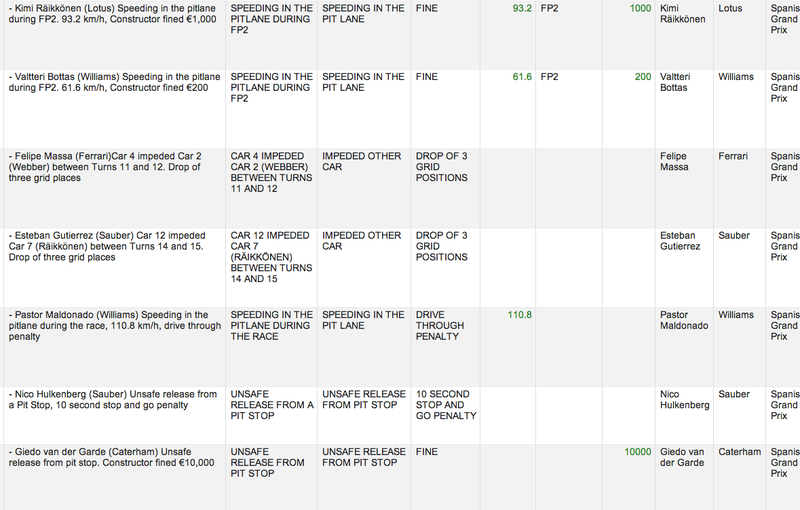 It may be worth trying to identify the outcome of each infringement investigation? 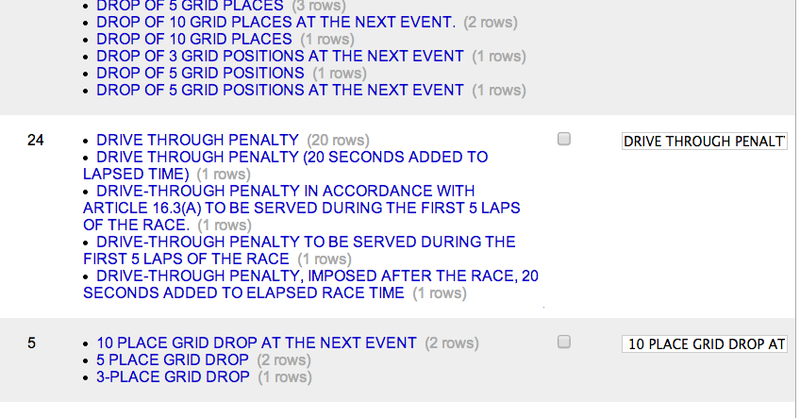 Viewing down the list further there may be additional core infringements we might be able to pull out. Tony, thanks for that, amazingly useful for a bunch of reasons! Not least of which is that I’m looking into data analysis software at the moment and that gives me a great example of how Openrefine can be used. 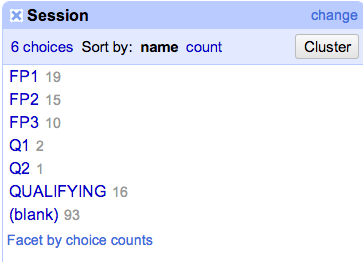 That’s the type of thing I’d normally try and do in Excel and give up 8 hours later.